What Does Code P0888 Mean? The transmission control relay (TCR) is used to supply power to the transmission solenoid pack during normal operation. When the relay is off, no power is supplied to the control pack and the transmission goes into “limp mode”. The relay is controlled by the powertrain control module (PCM) and/or transmission control module (TCM). Depending on the application, the TCR may be located in the intelligent power module (IPM), which is basically a smart fuse box, or in a standard fuse box. 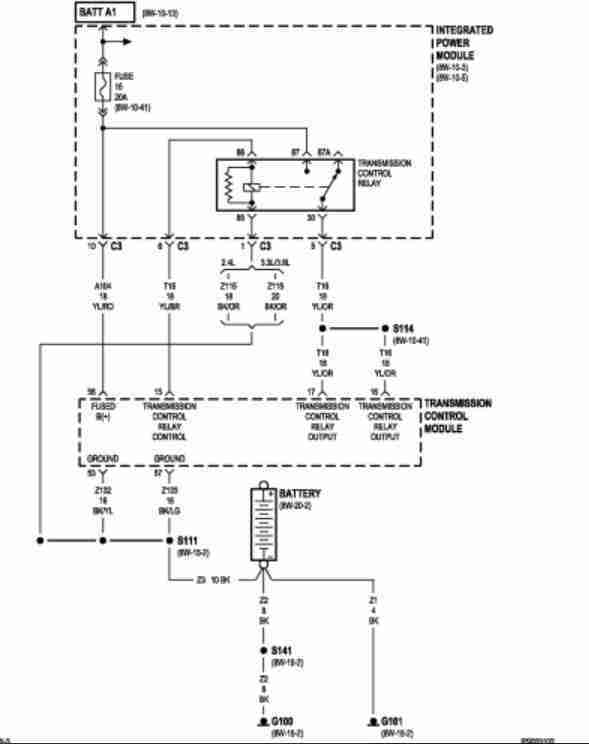 Code P0888 indicates the TCM has detected a problem with the transmission control relay and/or circuit. What are the common causes of code P0888 ? What are the symptoms of code P0888 ? Symptoms associated with code P0888 may include an illuminated check engine light, a vehicle that will not shift and a vehicle that is stuck in “limp” mode. How do you troubleshoot code P0888 ? Start by removing the transmission control relay. Inspect both it and its mounting socket. Look for corrosion, burnt terminals, etc. Repair as needed. Next, check for technical service bulletins (TSBs) about the concern. If no problems are found up, move forward with a sequential diagnosis of the system. Refer to the manufacturer’s service information for the exact diagnostic process. Typical relay terminal identification is as follows. Consult the factory repair information for your specific vehicle. Terminals 85 and 86 are the primary circuit used to energize the relay. Terminal 85 is the ground side and 86 is the power side. Terminals 87 and 30 are the secondary side of the relay. The secondary side acts like a switch that closes when the primary side is activated. Terminal 87 is the B+ input and 30 is the relay output. Remove the transmission control relay. Activate the primary side of the relay by jumping it. To do this, attach jumper wires to a 12-volt power supply (such as the vehicle battery). Connect one jumper between the battery negative terminal and the relay ground terminal (typically terminal 85). Next, connect the other jumper wire between the battery positive terminal and the relay ground terminal (typically terminal 86). When the second wire first makes contact, you should hear the relay click. If it does not click, the relay is likely faulty. With the jumper wires still attached, you can perform a secondary test of the relay. To do this connect a multimeter set to ohms between the two remaining relay terminals (typically 87 and 30). The meter should read a numeric value. If it reads out of limits (OL), the relay is faulty and should be replaced. Remove the transmission control relay. Turn the vehicle ignition on and use a test light to check for power to the TCR. Connect a test light between the battery negative terminal and the TCR B+ terminal in the fuse box. The light should illuminate. If it does not, there is a problem on the power side of the circuit. Consult the factory wiring diagram and repair the power side of the circuit as necessary. 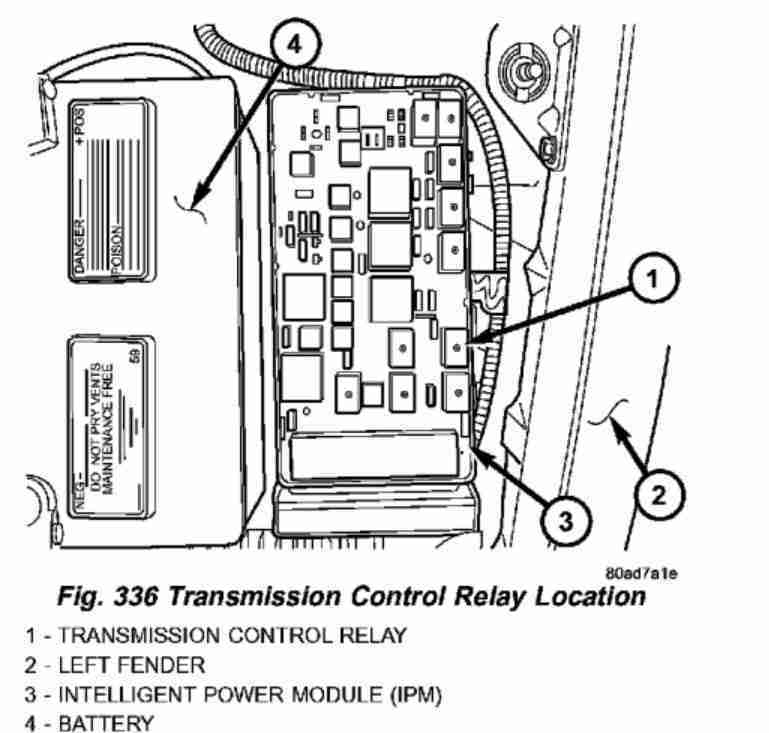 A typical transmission control relay wiring diagram. Remove the transmission control relay. Turn the vehicle ignition off and use a test light to check for TCR ground. Connect the test light between the battery positive terminal and the TCR ground terminal in the fuse box. The light should illuminate. If it does not, there is a problem on the ground side of the circuit. Consult the factory wiring diagram and repair the power side of the circuit as necessary. Remove the transmission control relay. Turn the vehicle ignition on and use a test light to check for power to the TCR. Connect the test light between the battery negative terminal and the relay control terminal in the fuse box. The light should illuminate. If it does not, there is a problem on the control side of the circuit, or the TCM is not commanding the relay on. To determine which is to blame, turn the ignition off. Use a digital multimeter set to ohms to check for continuity between the powertrain control module and TCR. Remove the TCM electrical connector. Connect the meter between the TCR control terminal on the TCM and the relay control terminal in the fuse box. The meter should read a numeric value. If the meter read out of limits (OL) there is an open circuit. Consult the factory wiring diagram and repair the power side of the circuit as necessary. If the circuit between the TCM and TCR is good, you’ll want to check that the TCM is supplying power to the TCR. To do this, turn the ignition on and set the meter to read volts. Connect the negative meter lead to the battery ground terminal and the positive meter lead to the TCR control terminal on the TCM. The meter should read battery voltage. If it does not, there is a problem with a TCM or its programming. However, TCMs rarely go bad, so it’s a good idea to double check your work up to this point. What other relays are connected to the transmission relay ?